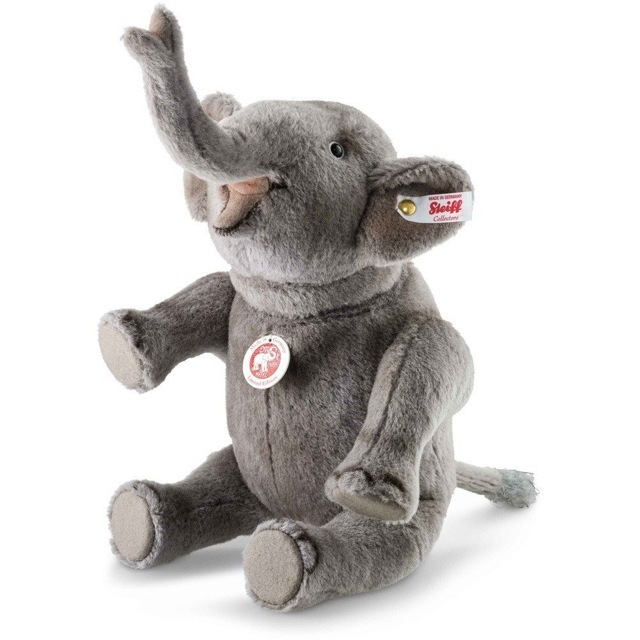 Nelly Elephant is a 4-way jointed (1 in head, 1 in neck, 2 in arms) alpaca pachyderm whose arms, head and neck are flexible. Nelly is designed to display optimally as a seated elephant. Nelly Elephant has elaborate airbrush shadings on her trunk, face, and feet. She features glass safety eyes and a white limited edition ear tag with gold-plated "Button in Ear." Made in Germany. Includes Steiff box, certificate of authenticity and Steiff shipping box. Condition: NEW, includes Steiff numbered limited edition certificate of authenticity, Steiff box and Steiff shipping sleeve.